Herbert Joel Robertson obituary. Carnes Funeral Home. Mar 13, 2015 Lit by ~ Faye & Albert Urps, Jr.
Herbert Joel Robinson Jr., 60, of Texas City, Texas, passed away on March 6th, 2015 in Galveston, Texas. Visitation will be held starting at 6:00 p.m. at Carnes Funeral Home-Texas City on March 12th, 2015. Funeral Services will be held at Greater Barbour's Chapel Baptist Church on March 13th, 2015 at 10:00am with Pastor Andrew W. Berry II of Greater Barbour’s Church officiating. Burial will follow at Houston National Cemetery, 10410 Veterans Memorial Drive, Houston, Texas. Herbert Joel Robinson, Jr. was born in Fort Carson, Colorado to Herbert and Nadine Robinson on October 29th, 1954. Herbert Jr. relocated with his family to Texas where he was educated in the La Marque Independent School District. He graduated from La Marque High School in 1972. Herbert Jr. proudly joined the United States Army in 1975 where he was ranked as Sergeant 1st Class. 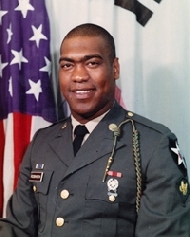 During his tenure in the Army, he served in Desert Storm and received the Bronze Star Medal of Service. He also completed tours in Germany and Korea. He retired from the military after 20 years of service. After retirement duty, Herbert Jr. attended College of the Mainland to obtain his barber's license. He owned and operated his own barbershop for many years until retirement. He enjoyed spending time with family, especially his girls and grandchildren. He was a proud Shrine Noble AEAONMS, a SR Pier 33rd Degree Mason, Past Master of the Pride of Texas City Masonic Lodge # 193 and transitioned as a member of La Marque Masonic Lodge #373 Most Worshipful Grand Lodge of Texas Prince Hall Affiliated. Brother Robinson spent numerous hours serving in his fraternal and civic organizations. He is preceded in death by grandparents, Dave and Hattie Dent, Thomas and Genevieve Robinson; sister, Joanne, and cousin, Matthew “Bobby”. Left to cherish the memory of Herbert Jr. are parents, Dr. Herbert and Lois Robinson and Nadine Robinson; wife, Loretta; daughters, Brianna (Arthur) and Danielle (Raymond); grandchildren, Tyrone “Tiger”, Malcolm, Jaydon, Joshua and Rayelle; stepdaughter, Sherri (Joshua); brothers, Elliott “Bubba” (Andrea) and Joseph; sisters, Gwyn ”Neacy” (Andrew), Rhonda (Michael), Pamela and Joelina (Al) and numerous loving uncles, aunts, nieces, nephews, cousins and friends. Memorials may be sent to Carnes Funeral Home-Texas City, 3100 Gulf Freeway Texas City, Texas 77591. Dorthea Jones is the Family Funeral Director. The family wishes to extend their gratitude to the medical and professional staff at UTMB. Herbert Jr. will remain in our hearts forever.